With the US Census Bureau’s intent to change the questions it asks millions of Americans about health insurance, which will lower the estimated number of uninsured Americans, it’s pretty clear that the Obama Regime is looking to alter and adjust the metrics and success criteria of ObamaCare. 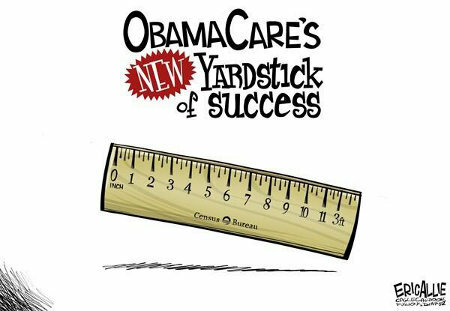 Simply put, they’re changing the yardstick. On simply cannot violate the boy’s Black Privilege by not allowing him to lower the bar for his performance in order not to fail. This entry was posted on Wednesday, April 23rd, 2014 at 8:32 am and is filed under Politics. You can leave a response, or trackback from your own site.